With the iPhone 4S arriving at market today, the never-sated Apple rumor mill is clamoring for more grist. And, as always, there’s plenty of it to be had, this time involving the iPad 3. According to Susquehanna Financial analyst Jeff Fidacaro, the device is headed into production. Supply chain checks suggest to Fidacaro that Apple is ramping up its fourth-quarter iPad builds to between 12 and 14 million, from between 11 million and 13 million. 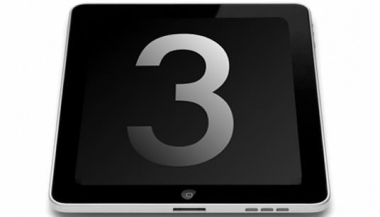 And, importantly, that upward adjustment is due in part to an early iPad 3 production run. “Since our last month supply chain checks we are now seeing 600,000 to one million iPad 3 builds showing up on the plan for the fourth quarter of calendar 2011,” Fidacaro told AllThingsD. “Our previous estimate did not include any iPad 3s.” So preparations for Apple’s next big product launch are already under way, presumably with an eye toward an early 2012 launch — March, perhaps — the same month Apple uncrated the iPad 2. Incidentally, Fidicaro believes Apple shipped 11.5 million iPads in the third quarter and will likely ship 13 million in the fourth.